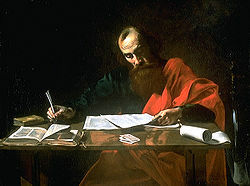 Paul writing his epistles by Valentin de Boulogne (1591–1632). The Pauline epistles are letters written to various early Christian communities by the Apostle Paul. Paul has been attributed by many as the author of Epistle to the Hebrews due to internal evidence within the work, but several others, such as Barnabas, Luke, and Apollos are also claimed to be the author. The controversy, however, does not affect the authority of the epistle. These are letters written to various early Christian communities by the Apostle Paul. but Irenaeus writes that the mentality was Pauline. This page was last modified on 18 February 2013, at 16:06.